USA Department of Transportation coordinates the planning and development of a safe and balanced transportation system serving people of the country in all the regions. The department manages efficient movement of people or goods of the country. The transportation system of USA includes roadway, airways, railways, seaways, spaceports, bicycle, pedestrian facilities and bus transit. CR-10 is read as "County Road Ten"
US 1 - It connects Fort Kent, ME to Key West, FL. United States of America relies heavily on its road transportation for the movement of goods and people. There are many intercity buses to explore cities of America. Greyhound Lines, Inc. is the largest provider of intercity bus transportation, serving more than 3,800 destinations. There are many intercity buses with routes in all parts of USA and many regional intercity services like Megabus and Boltbus. Ticket services are available online for all of the bus services. Greyhound provides largest services in the USA serving almost all the destinations. It provides direct services between many pairs of cities. It has a established name for offering safe, enjoyable and affordable services across America. If there are no direct services, transfer between buses can be incorporated into a single ticket. If the city is not served by Amtrak, Greyhound can be used to make connection by purchasing a ticket for the bus connection from Amtrak in conjunction with the purchase of their rail ticket. A system map and timetables for all buses can be found here. For Routes and Services click here. Megabus has a large presence in parts of the Northeast, South, and Midwest. Megabus tickets can only be bought online or over the phone. Megabus offers direct connections between many pairs of cities. When a direct service is not available, some combinations of connections can be booked as a single ticket. To know bus stops click here. To book tickets online click here. BoltBus serves the Northeast, the Pacific Northwest, and California and Nevada. To buy tickets click here. Nemesis is a large provider in the state of Texas, with regular service between the cities of Houston, San Antonio, Austin, Dallas, Ft. Worth, Waco, Galveston, and Beaumont. Jefferson Lines operates many routes in the nation's heartland. States covered include Wisconsin, South Dakota, Montana, Oklahoma, Iowa, Arkansas,Kansas, Minnesota, Missouri, Nebraska, North Dakota, Texas, and Wyoming. Trailways is another provider of intercity bus service. They are not a single company, but a group of individual companies allied to form a network. Its services may focus more on intra- rather than inter-regional travel. The trucking industry is the main source for the transportation and distribution of commercial and industrial goods using commercial motor vehicles (CMV). CMVs are most often trucks; usually semi trucks, box trucks, or dump trucks. The trucking industry is a backbone to any economy as they are main provider of raw materials for manufacturing industries, foods and goods for people. Large trucks and buses require a commercial driver's license (CDL) to operate. The USA provides rail facilities in all over the America. Long-distance trains in the USA are operated by the National Railroad Passenger Corporation, better known as Amtrak Long-distance services (on named trains) mostly operate daily on these routes, but some run only three-to-five-days per week. Amtrak connect all of America’s biggest cities and many of its smaller ones. Amtrak, the national rail operator, connects America in safer, greener and healthier ways. Amtrak operates more than 300 trains each day. Amtrak operates a nationwide rail network, serving more than 500 destinations in 46 states, the District of Columbia and three Canadian provinces. To find a station click here. Alaska Railroad operates daily departures mid-May to mid-September. This is a best way to see mountains, glaciers, and wildlife from your seat on the Alaska Railroad. It runs from Seward through Denali, Anchorage, and Fairbanks to North Pole, with spurs to Whittier and Palmer. It also play a vital role in moving Alaska's natural resources primarily coal to ports in Anchorage, Whittier and Seward as well as fuel and gravel for use in Anchorage. Book Rail tickets online here. Many large American cities have commuter rail systems that connect the suburbs with that metro area's central metropolis. Bicycles are allowed on board during weekends. 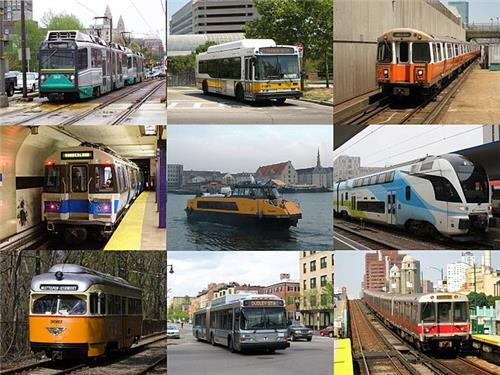 MBTA (Massachusetts Bay Transportation Authority): It is the public operator of most bus, subway, commuter rail, and ferry routes in the greater Boston, Massachusetts area. To know schedule click here. Metro-North- It serves New Rochelle, New York, via the New Haven Line. Service is very frequent during rush hours, with hourly service on weekends. For schedule and tickets click here. Long Island Railroad- It provide service from New York City to many points throughout Long Island, including well-known beach resorts such as Montauk. For schedule and ticket click here. PATH (Port Authority Trans Hudson). It provide service from several underground stations in New York City to Jersey City and Newark, New Jersey. New Jersey Transit- It serves the US state of New York, New Jersey; Orange, and Rockland counties in New York State; and Philadelphia County in Pennsylvania. It operates bus, light rail, and commuter rail services throughout the state. SEPTA (Southeastern Pennsylvania Transportation Authority)- It provides service within and around the greater Philadelphia area, including to Philadelphia International Airport. For schedules and tickets click here. MARC (Maryland Area Regional Commuter). It is a commuter rail system comprising three lines in the Baltimore-Washington Metropolitan Area. No service on weekends. VRE (Virginia Railway Express)- It is a rail service that connects the Northern Virginia suburbs to Union Station in Washington, D.C. No service on weekends. Metra- It is serving much of the Chicago metropolitan area in northeastern Illinois, with one line extending into southern Wisconsin. South Shore Line. A single line running along the south shore of Lake Michigan, from Chicago to South Bend, Indiana. Metrolink- It serves in the Los Angeles area, connecting Los Angeles Union Station with Oxnard, the San Fernando Valley, Lancaster/Palmdale, San Bernardino, Riverside, Orange County and Oceanside. Caltrain- Commuter rail service between San Francisco and San Jose, California. Many of the flights to the airport are domestic flights from within the United States where Atlanta serves as a major transfer point for flights to and from smaller cities throughout the Southern United States. The airport also operates another two international airports, Van Nuys and Ontario International airports, in Southern California. Chicago O'Hare (ORD) is one of the busiest airports in the US, being a major international and domestic hub for some of the largest carriers in the world (including United Airlines and American Airlines). The airport offers services to 191 destinations worldwide. It has seven runways and 155 aircraft gates. Passenger terminals include four domestic and one international / domestic terminal. Waterways are critically important to the transportation of people and goods throughout the world. Fishing and pleasure boats are numerous, and passenger service connects many of the nation's islands and remote coastal areas, crosses lakes, rivers, and harbors, and provides alternative access to Alaska which bypasses Canada. The Port of Los Angeles, also called Los Angeles Harbor Department. The Port of Los Angeles is the busiest container port in the United States. The port is under the control of a five-member Board of Harbor Commissioners. The Port of Long Beach, also known as Long Beach's Harbor Department. The seaport is responsible for producing jobs, generating tax revenue, and supporting retail and manufacturing businesses. The Port of Savannah is a major U. S. seaport located at Savannah, Georgia. The Port of Savannah, home to the largest single-terminal container facility of its kind in North America, is comprised of two modern, deepwater terminals: Garden City Terminal and Ocean Terminal. It was the first major port on the Pacific Coast of the United States to build terminals for container ships. The Port of Oakland is a major container ship facility located in Oakland, California on San Francisco Bay. The principal facilities of the Port of Virginia are four marine terminals and one intermodal container transfer facility: Virginia International Gateway (VIG), Portsmouth Marine Terminal (PMT),Norfolk International Terminals (NIT), Newport News Marine Terminal (NNMT), at Portsmouth, all on the harbor of Hampton Roads, and the Virginia Inland Port (VIP) at Front Royal, Virginia. The department overviews the entire transportation network of the America. The transportation system in USA comprises of the roadways, airways, railways and the waterways. The mission of the Department is to serve the United States by ensuring a fast, safe, efficient, accessible and convenient transportation system that meets our vital national interests and enhances the quality of life of the American people, today and into the future.